Product #31218 | SKU RODNTR | 0.0 (no ratings yet) Thanks for your rating! 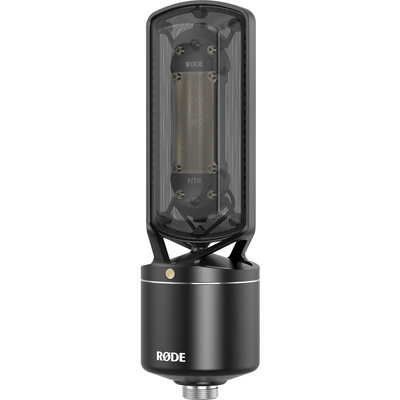 Designed by Rode to be at home in world-class recording facilities as well as project and home studios, the NTR Active Ribbon Microphone is based around its sensitive 1.8-micron-thick ribbon element, which is capable of providing a wide 20 Hz to 20 kHz frequency response, uncommon for a typical ribbon mic. Thanks to its broad response, its applications go beyond that of a typical ribbon mic, allowing it to be more accommodating for a broader range of vocal types, as well as strings, brass, electric and acoustic guitars, drum overheads or room mics, and more. Internally, the mic features a custom-designed and manufactured transformer, in addition to an internal shock mounting system. A ribbon-securing travel screw is included, allowing you to secure the sensitive ribbon while transporting the mic, assuring it is not accidentally damaged. Like many Rode microphones, the NTR has an extended 10-year warranty with registration, which includes one free ribbon replacement during the period.